It’s Bay State Bike Week! Quincycles and Quincy’s Planning Department are celebrating with our Third Annual Ride the Spine event. This year our route along the “Spine” of Quincy will include the new bike infrastructure on Hancock Street in Quincy Center. Installed last October, these new bike lanes, bike boxes, and pocket bike lanes provide Quincy cyclists with more visibility and safer space on our roads. Once again we will be escorted by some of Quincy’s finest police officers for the duration of the ride. After the 9 mile loop ride there will be refreshments and a raffle of items generously donated by Anderson Bicycle and Landry’s Bicycles. 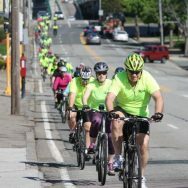 We are hopeful for a future expansion of the bike lanes to eventually connect the Neponset Bridge to the Fore River Bridge making Quincy safer for local riders and a gateway for cyclists from the South Shore and Boston. Join us as we roll toward this goal. RSVP here so we know to expect you! Quincycles rides are open to members and non-members. Bicycling involves certain inherent risks. Your participation in a Quincycles ride constitutes your agreement to this Acknowledgement, Waiver and Release. Please review our Ride Guidelines before the ride and check our Facebook page for weather related updates.